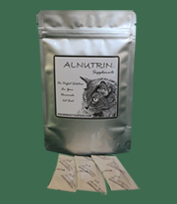 Are you wondering about the diference between Alnutrin with Calcium and Alnutrin with EggShell Calcium? Ingredients: Egg yolk powder, calcium carbonate, taurine, iodized salt, vitamin E, iron amino acid chelate, copper citrate, manganese amino acid chelate, zinc oxide, vitamin D3, vitamin B12, vitamin B1. We offer two products with calcium for diets without bones: Alnutrin with Calcium (with limestone) and Alnutrin with EggShell Calcium (made with eggshell powder). Both products are similar in composition and you can use them the same way in all recipes or in our Nutrient Calculator. 1/2 cup (or 120 g) of water, can be adjusted as needed. Mix well. Divide into storage containers and freeze unused portion. You can find more recipes in our Recipe Library. What is the best place to buy the meat? You can get it from Sam’s Club, Whole Foods and other food chains or local stores. Try to get a feel if the place is clean. You can also order the meat over the internet (go to Links to get contact information for internet raw meat suppliers). www.knowwhatyoufeed.com © Copyright 2008, Alternative Nutrition LLC , all rights reserved.